This groundbreaking resource provides comprehensive coverage across all aspects of business analytics, presenting proven management guidelines to drive sustainable differentiation. Through a rich set of case studies, author Evan Stubbs reviews solutions and examples to over twenty common problems spanning managing analytics assets and information, leveraging technology, nurturing skills, and defining processes. Delivering Business Analytics also outlines the Data Scientist’s Code, fifteen principles that when followed ensure constant movement towards effective practice. Practical advice is offered for addressing various analytics issues; the advantages and disadvantages of each issue’s solution; and how these solutions can optimally create organizational value. Drawing on the successes and failures of countless organizations, author Evan Stubbs provides a densely packed practical reference on how to increase the odds of success in designing business analytics systems and managing teams of data scientists. 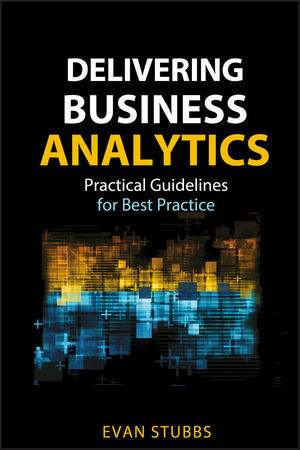 Uncover what constitutes best practice in business analytics and start achieving it with Delivering Business Analytics. EVAN STUBBS is the Chief Analytics Officer for SAS Australia / New Zealand and sits on the board of the Institute of Analytics Professionals of Australia. He is a prolific speaker and evangelist for the power of analytics, having written The Value of Business Analytics, a book explaining why some teams succeed while others fail. Over the years, he has developed human-machine interfaces for concept cars and models that predict criminal behavior, and has helped organizations establish analytical centers of excellence.